Shirley Dietrick is someone most are unlikely to forget. Always cheerful, her recipients were met with a hug, “hello Darlin’ and a fun story. Her generous spirit, kind soul and infectious sense of humor were her trademarks. She was dearly loved in her community of Masons, Shriners, Amaranth, Daughters of the Nile, Bridge, Pinochle and Shirley clubs, many friends, neighbors and family. Shirley was the only child of the late Harry I. and Stella F. Tenenbaum. She was born September 28, 1928, in Denver, Colorado at the Mary McDonald Maternity Hospital; a graduate of North High School. She was united in marriage in 1946 to the love of her life, Dee, with whom she shared a 63 year romance. 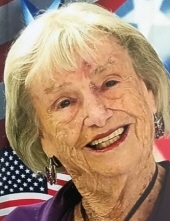 She resided on North Federal Blvd for nearly 40 years before moving to Arvada and during her years in Arvada, spent 20 semi-annual years in Mesa, Arizona, playing golf and having fun with Dee, proudly referring to them as snowbirds. They had one daughter, Dea, two granddaughters Reni and Rena, and 4 great-children. Shirley’s Tribute Service will be held on November 8, 2018, at 10:00am at Foothills Community Church, 8270 W 80th Ave, Arvada, CO 80005. To send flowers or a remembrance gift to the family of Shirley Mae Dietrick, please visit our Tribute Store. "Email Address" would like to share the life celebration of Shirley Mae Dietrick. Click on the "link" to go to share a favorite memory or leave a condolence message for the family.